Paul, who was born in the Old Pueblo and grew up in Marana, attended Marana High School where he played football and basketball and set several school records in track and field. During his senior year (1963) he was a member of the Marana basketball team that took second in the state. Paul continued to excel in basketball and track at Eastern Arizona University, graduating in 1968. He played football during his senior year and was drafted by the Cincinnati Bengals of the American Football League, where he played for four years. He also played two years for the Houston Oilers and spent a year in the World Football League. 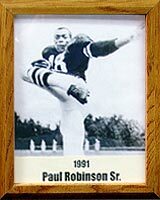 While with Cincinnati, Paul was named Rookie of the Year and Most Valuable Player (1968), the first Bengal to win such an honor. He set a team record for the longest run from scrimmage, 87 yards.